Pullup alternatives are just as effective at toning and strengthening your back. Pullups are a wonderful exercise to tone and strengthen your arms and back, but they are a difficult exercise to perform, and not always easy for women to complete if they don't have the initial strength. Whether you want to do pullups for personal achievement, or for a fitness or work-related goal, worry not. There are alternatives you can do to both prepare yourself for real pullups and still effectively tone your back and arm muscles. The cable lat pulldown is a good introductory exercise to prepare you for the pullup. Sit in the machine and grab the lat pulldown bar with both hands in a wide grip. The grip specifically works your latissimus dorsi muscles; the same muscles worked in the pullup. Pull the bar down towards the top of your chest, squeezing your shoulder blades together all the way down. Hold the down position for a moment, then slowly release. To target all the muscles in your back, vary your lat pulldowns with narrow and reverse grips as well. Do assisted pullups on a weight stack machine that subtracts the amount of weight you choose from your actual body weight. Start with a heavier load, so you actually lift a lighter weight. When you do the pullups, work through your whole range of motion, allowing your muscles to fully stretch on the downward movement, and fully contract on the upward movement. Also, vary your hand position to target all muscle groups. Negative pullups are an ideal way to train for unassisted pullups, according to Military.com. 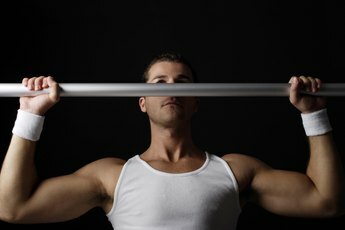 Grab a stool or block that allows your chin to rest above the bar when you hold onto it. Step up to the bar, grasp it, and then bend your knees so you fully support your body on the bar. Over a period of five to 10 seconds, slowly lower yourself down to a full hang. Step back on the block and repeat the movement. Many gyms have resistance bands available. Find one that is a giant thick loop so you can secure it to a pullup bar. Stand on a stool and put your foot on the strap. Grab the pullup bar and hang with your arms straight. Bend your arms letting the band assist you on the way up to execute a pullup. The thinner the band, the less resistance there is. For less resistance still, place your knee in the loop rather than your foot. The National Strength and Conditioning Association recommends lifting a heavier weight for about six to eight repetitions for maximal strength gain. If your goal is to do unassisted pullups, lift a heavy weight that fatigues your muscles within that rep range. 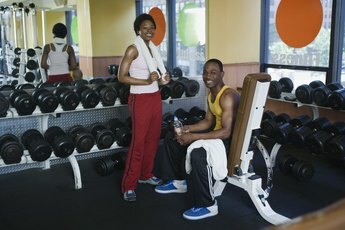 Do about four to five sets, with about one minute rest between each set. Work your back twice per week on non-consecutive days to allow your muscles to fully heal and recover in between training sessions. 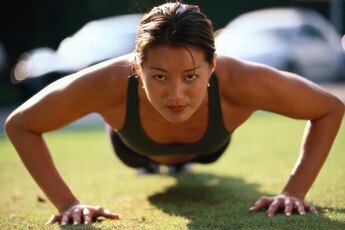 What Parts of the Arms Do Pushups Work?